An Irishman dispenses kilt etiquette. What’s going on? On my way to a meeting. I’m on a policy team with the Chicago Clean Power Coalition. We were partially responsible for getting the two dirty coal plants shut down last month. Dude, the kilt. Not really meeting attire. Is it laundry day? I do have to do laundry, but no. I have certain moments or days when I’m like, “Screw it! 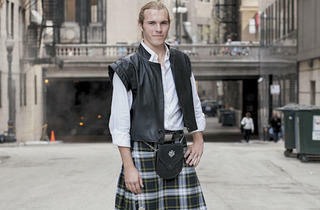 Today’s a kilt day!” It’s a way to be a little out there and gregarious. So, you’re Scottish? No, I’m Irish, so there’s really no good reason to be wearing this kilt right now. [Laughs] Most of my roots are in Appalachia. Both my mom and dad’s families were Appalachian coal miners. When the coal mines started losing business and workers, my dad’s family moved to Chicago to work in the steel mills. The mills paid a helluva lot better than the mines, and you didn’t get black lung as quickly. 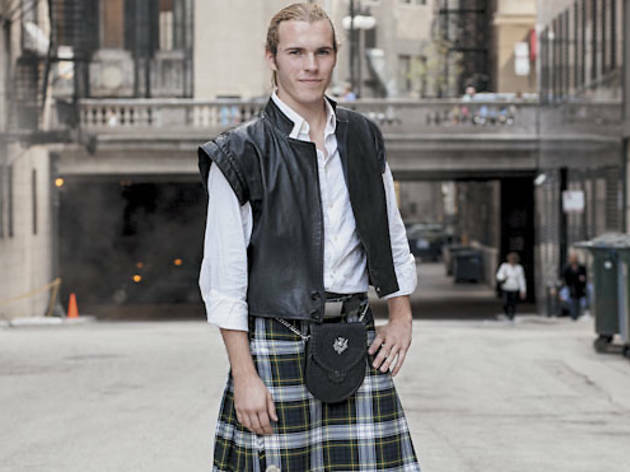 Kilt etiquette question: underwear or no? You can get away with going commando, but it’s always classier to wear underwear. I imagine it could get a little breezy under there. Actually, kilts are designed to keep you warm. I’ve been out on days when it’s been frickin’ hailing on me and I was just fine. The forecast in Scotland is usually cloudy and rainy. Just like Chicago!